The composer had a recording published in Tehran, which were written based on regional folk tunes from different parts of Iran. 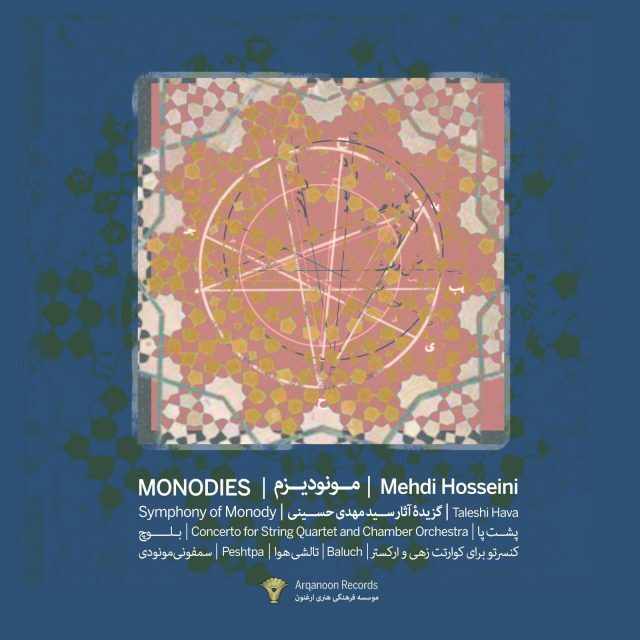 Mehdi Hosseini often uses the word monodies not only as the title of his composition, but also as a musical term; by which he means the characteristics of single voice structures, adapting themselves to any musical texture. 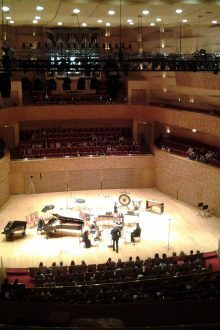 The composer had a recording published in Tehran, which also takes on the title Monodis. For this album he collected compositions which were written based on regional folk tunes from different parts of Iran. The album was recorded in Russia by well-known local soloists, ensembles, and the Saint-Petersburg State Philharmonic Orchestra and State Academic Orchestra. All of the compositions were written between 2003 and 2009. 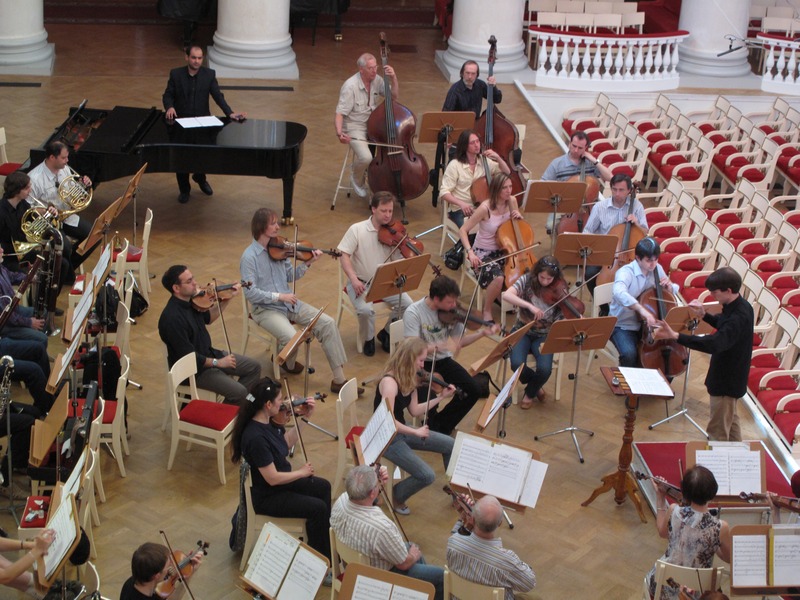 Mehdi Hosseini observes a St. Petersburg State Philharmonic Orchestra rehearsal. Glancing through Mehdi Hosseini’s works at the advent of his course as a composer (Monody symphony and string quartet no. 1), we encounter a sort of confusion and inability to separate from conservative doctrines. This can be seen with all composers without exception. The influence of master composers upon new composers is inevitable and undeniable. This is true in the case of Hosseini’s initial works. He has been under the influence of Shostakovich, Stravinsky, Amirov’s heavy shadow and other great Russian composers. This is a privilege for him because it signifies his mastery over the heavy expression of Russian composing. This achievement can only be accomplished by extensive studies and spending much time on analyzing works with the final result being the complete mastery of these masters’ works. Speaking the language of others is a very complicated and difficult task, especially if it is done so well that the speaker is difficult to recognize. This problem has been resolved by the passing of time; and with a look at his new works we see a fresh independence and a very personal new language. It goes without saying that the use of Iranian ethnic music has assisted him in finding this expressive independence as quickly as possible. Hosseini’s approach towards Iranian folklore music takes a different path from what has been done in the field before. Iranian composers have mainly approached this music in a limited way, transcribing the melodies for western solo instruments, ensembles and orchestra. The following composers have broken this mold: Iraj Sahbaee Ethnic Sounds for Piano, Lorris Cheknavarian Armenian Bagatels, Reza Vali Deilaman Local Songs and also Samin Baqcheban Ethnic and Shalil and Mohammad Taqi Masoodieh Movement for String Orchestra. All these composers have found a kind of harmony and counterpoint based upon melodic structures embedded in the heart of this ethnic music and have founded their composing principles based solely on this music. Of course most of them have been loyal to the formal structure of the music and restricted themselves from violating these structures. By following these guidelines, they show respect for the music and its originality. Mehdi Hosseini has arrived at these same conclusions as well. The difference being that he has treated harmony and counterpoint in the simplest way and has stayed loyal to the basic structure (monadic in his words) of ethnic music. On one hand, he has been loyal to this tradition in pieces such as Talesh Weather and on the other hand he has used the developmental tradition of western conservative music in such pieces as “The Concerto for String Quartet” and second movement Kalampoor of Baluch. Although this kind of development runs parallel with western academic traditions, it is in fact completely different and more in line with the methods of such modernists and post-modernists as Messiaen, Stockhausen and Forer and perhaps it is a method of development, which can be said to be completely his own. Development in Hosseini’s works is formed according to basic qualities and structures, which are similar to the narrations of local musicians. In actuality, each work is comprised of a set of common aesthetics and musical characteristics, which act as the building blocks of Hosseini’s works and at the same time enjoy their own independent musical lives. – Rearrangement of familiar patterns by the use of frequent repetitions and transformations of the rhythmic, melodic elements. In all of his works, the main thematic materials of the piece are presented at the beginning of the work so that the listener has an opportunity to become familiar with the elements, which will later be transformed and developed. (An excellent example of how Hosseini transforms rhythmic, melodic patterns can be seen in the piece “The Back of the Feet”). All of these elements are repeated so much that the changes that Hosseini makes become particles, which atomically transform the homophonic and polyphonic textures of the work. This forward moving process, which is not entirely disclosed, eventually changes the whole essence of the piece. Of course, the concept of change here is quite different from the changes in other composers’ works; that is to say, the listener is exposed to an extraordinary change; a kind of transformation or abstraction of a recognizable object. Something that is being transformed is still recognizable. In some works, like in the second part of Baluch: Kalampoor, Hosseini uses material, intended originally to accompany the main melody in the original piece, in the form of a bizarre collage. He does this at various times, finding an independence from and at the same time a dependence on the original material, in order to use the rhythmic, melodic patterns in a way that does not follow the expectations of the listener. The featured piece in this collection is the Concerto for String Quartet and Chamber Orchestra. This work, which represents the peak of Hosseini’s expertise, implies many cultural and linguistic issues and structures. The points seen as chords in the piece do not refer to pointillism, but they are pauses, which are to be regarded as the expression of successive new statements. The dialogue among the four solo string instruments attempting to be heard through the tumult of orchestral sounds is a musical metaphor for the cultural status of the tribes of Iran. 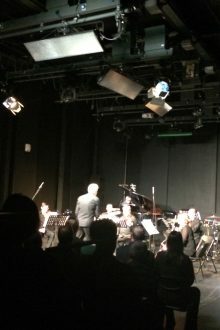 In this piece, Husseini reproduces the absurdity and multi-cultural aspect of societal and popular culture and conversations with the use of the orchestra. He represents the tumult of a society in which ethnic cultural elements are evident but cannot be easily heard. This society speaks in a language that is beyond understanding, even for itself, but the cultural identity of this disrupted society can still be found. Return to the origin is the theme that runs through Hosseini’s works. He eventually returns to the main elements of the music at the end of each work; and by re-expressing it after various diversions and transformations, he reaches out to grasp a commemoration of the albeit transformed past. For Hosseini, the final goal is not dependent on past but at the same time progression cannot be achieved without an understanding of what has already been. He considers that the past and the future are interrelated in a complementary way. The traditions and customs of the Bakhtiari are reflected in the names of their magham.